During the nineteenth century, many potteries were damaged or destroyed by fire, but no fire was more dramatic than that at the five-story K.T. 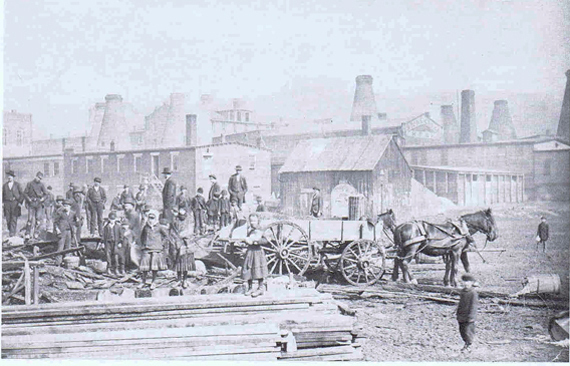 & K. China Works on Bradshaw Avenue in November 1889. Completed only the previous year, a gas leak near a packing room ignited the flames. Not only did this type of destruction cause financial loss to the owners, but it forced several hundred employees out of work. Following the fire, the editor called for better water pressure and the purchase of a steam operated fire engine which probably hastened the acquisition of the Silsby pumper three months later. The plant was rebuilt the following year and contained the first sprinkler system in an East Liverpool pottery. Fires were a destructive force in American urban areas during the nineteenth century; volunteer fire departments and relatively primitive equipment usually proved wholly inadequate. The ruins of Frank Stewart's Feed Store at the corner of Sixth and Washington Streets in March 1881 attest to that fact. 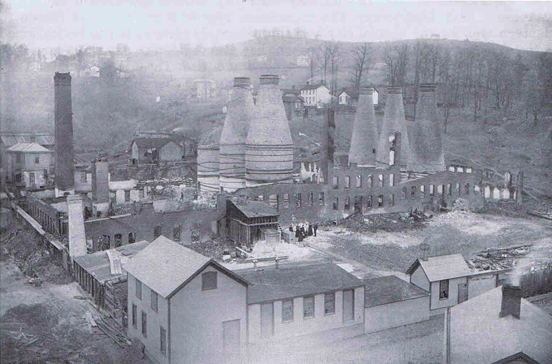 Note the kiln stacks in the background.